The VisiJet® FTX Cast material was created especially for the ProJet® 1200. This is a UV-curable plastic with wax that was designed specifically for delicate castings. 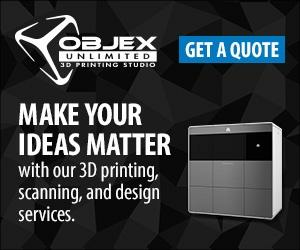 ©2016 Copyright • Objex Unlimited • 36 Fieldway Road, Toronto, ON M8Z 3L2 • 416-233-7165 • Objex Unlimited 3D Printing Studio • Toronto’s 3D Printing and 3D Service Experts • Objex Unlimited is your resource for everything 3D. We take great pride in the services we provide, and will find the best 3D printing solution for you. We will work with you to complete your project and reach your goals ahead of schedule. We offer a variety of 3D printers, 3D scanners, 3D Design, Additive Manufacturing, Rapid Prototyping and 3D software, and will work with you to find the best solution for your needs. We are an authorized reseller of 3D Systems, Artec Group, LMI Technologies, Geomagic and Agisoft 3D products. Our talented and diverse staff deliver high-quality, industry-leading results. Our commitment is to fulfil your project needs within budget and on-time. Servicing: Canada, Ontario, Toronto, Montreal, Quebec, Edmonton, Calgary, Vancouver, Markham, Mississsauga, ​Oshawa, Richmond Hill, Concord, Durham, Ottawa, Waterloo, Kitchener, Windsor, Guelph, Vaughn.